It would have behooved me to write my review of Moon yesterday, since it was the 40th anniversary of Apollo 11 landing on the moon, but. Well. I wrote about government cheese instead so I think that that’s enough of a memorandum. Despite the seeming impossibility of this request, spoilers are at an absolute minimum since it’s a very spoiler-able movie. Though, I am happy to provide the main spoiler: Sam Rockwell is hot. Sorry! Ruined the ending for everyone! The trailer is vague for a reason, so I won’t spoil anything about the plot that can’t be gleaned from those two minutes. As you can see, this small-budget indie film deals with previously explored sci-fi territory: space travel, cloning, artificially-intelligent robots. In case you couldn’t tell, I’m not really a sci-fi expert, but the movie manages to strike a balance for the audience: it’s a sci-fi thriller/mystery, a smart comedy, a long-distance love story, a vehicle for introspection about ethics and technology. There was some laughing and, of course, some crying, but mainly a lot of thinking afterward—a sign of a good movie. 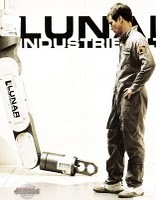 The basic plot without spoilers (as seen in trailer): Sam Bell (played by Sam Rockwell) is an astronaut working for a three-year contract on the moon to harvest and collect Helium-3, a clean energy supply discovered and provided by his parent company, Lunar Industries. Because there is no direct communication between Earth and Sam, he relies on GERTY (voice provided by Kevin Spacey—pun intended, I’m sure) for daily assistance. The movie opens toward the end of Sam’s three-year stint, when his marriage and health have slowly deteriorated over time. His only means of communication with his wife and three-year-old daughter is infrequent video messaging; his countdown to going home becomes an obsession as he realizes the impact of his isolation. When he goes out to collect a container of Helium-3 two weeks before going home, he crashes his space vehicle and wakes up in the infirmary, cared for by GERTY. Things start to get interesting when his suspicions lead him to travel outside the base (against GERTY’s wishes) where he finds a wounded man inside a crashed vehicle. Despite the moon shots being done with miniature replicas, the cinematography doesn’t reflect a film with a five-million-dollar budget. And while one of the main themes does concern the impact of an isolated environment, with this specific environment being a character in its own right, the film shows just enough to convince the audience without having to go overboard and get showy. And really, that’s all a movie should need; when special effects become the main component of a movie, the movie probably isn’t trying to be more than an impressive moving picture. Moon is the first full-length film directed by Duncan Jones, David Bowie’s son, and the depth of themes in the movie makes up for the expected sci-fi/action flaws; the film demands a psychological journey, and the cleverness was refreshing (the kind of cleverness that often comes with a novice directing). Even the score was understated yet moving—background support that enhanced but didn’t overshadow. That being said, Sam Rockwell makes this movie. In the hands of a less talented actor, I might have been less impressed or even bored with the initial mundanity of Sam Bell’s daily life. But Rockwell injects emotion and interest into every scene, from building a wooden model of a town to getting a haircut with a GERTY-powered flowbee. Without spoiling too much, I’ll just say that Rockwell’s adeptness allowed the audience to explore the question of individuality in cloning; he played two distinct people with such care that the audience loves both equally but separately. My one complaint was the use of Kevin Spacey’s voice, as it is recognizable to the point of distraction, but he did provide a level of creepiness that you may have noticed in the trailer, leaving you wondering: is the robot evil or what? Well, you should probably see the movie. I suppose I’m only offering ratings for vanity’s sake at this point but: 93 out of 100.